When you saw the Solo movie did you pick up on the strange thing that occurred when Han and Lando played Sabbac for the second time? Han owed Lando Calrissian a ship and he didn't mention it! Think out about for a moment. In the original game of Sabbac where Han and Lando met for the first time, the final bet was for each other's ship. Han lost and thus owed Lando a ship. The Falcon came into the equation when Kira and Beckett negotiated directly with Lando to use his ship to get them to the Kessel mine. When that whole situation was resolved, Han still owed Lando a ship as a result of their gambling. Did Lando forget this when Han arrived for a rematch on Tanaab? He probably remembered how he deserted Han when things got a little tense when Enfys Nest turned up to steal their hard-won coaxium. Maybe he felt slightly guilty for that? Maybe it was because he knew he had cheated Han by literally hiding a spare Sabbac card up his most fashionably dressed sleeve? Either way, if he had mentally forgiven the debt without telling Han, he was still willing to cheat him again on the second game. This time, however, Han was very wise to the card trick and swiped it from Lando's person when they hugged. So, in that game Han won fair and square and so deserved the Millennium Falcon. Lando probably couldn't have even called him out on the debt because he would have suspected it was Han who swiped the card, meaning Han would have known he was cheated the first time around and so could have easily countered the collection of the debt. 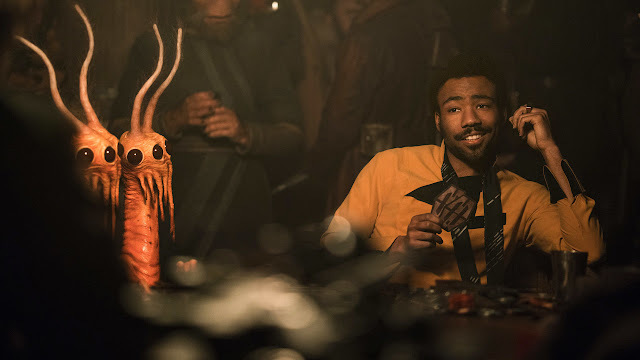 Even if Lando did want to acknowledge that indiscretion, the real issue to him would have been his reputation as a Sabbac player - if the word had gotten around he was a Sabbac cheater, his reputation would have been quite tarnished and he wouldn't have been able to find a high stakes table on any planet. Buy the game of Sabbac yourself from Amazon!